Economic opportunities. 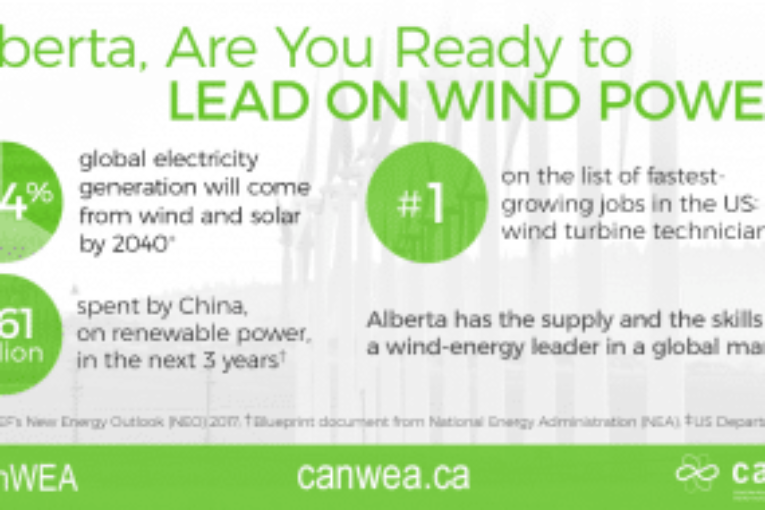 With 4,500 MW of utility-scale wind energy capacity being added to the grid by 2030, local spending in Alberta related to project development and construction could reach $3.6 billion. With $137 million expected in local operations and maintenance spending, the total exceeds $3.7 billion. The report also estimates that the wind industry would contribute $25.5 million in municipal property taxes and $13.5 million in land lease payments to Alberta land owners during that period. New technologies, such as advanced manufacturing, 3-D printing, and virtual reality, have the potential to revolutionize local production and reap further economic benefits for the province. Equally important, the sector can play a role in diversifying Alberta’s economy – helping to reduce its vulnerability to the boom-and-bust cycle that typifies the oil and gas industry. Export opportunities. It has been estimated that wind and solar will make up 48 per cent of the world’s installed generating capacity and 34 per cent of electricity generation by 2040. This means that renewable energy sources are set to represent almost three quarters of the $10.2 trillion the world will invest in new power generating technology until 2040 according to Bloomberg’s New Energy Outlook 2017. China’s National Energy Administration (NEA) will invest $361 billion in renewable power generation in the next three years alone. Alberta and Canada should and could claim a piece of this pie.